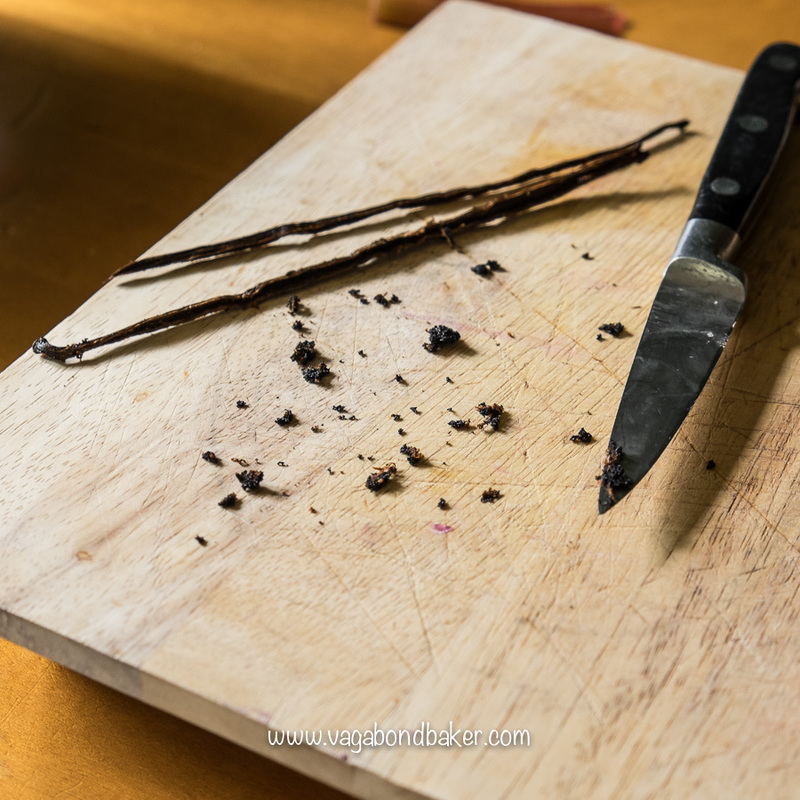 Gosh I love rhubarb; those tart pink sticks bring me such comforting joy and it is so much fun to cook with. 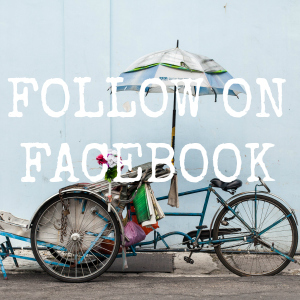 If you’ve been following this blog for a while you’ll possibly be well aware of my rhubarb appreciation, there a few rhubarb recipes in the archives! 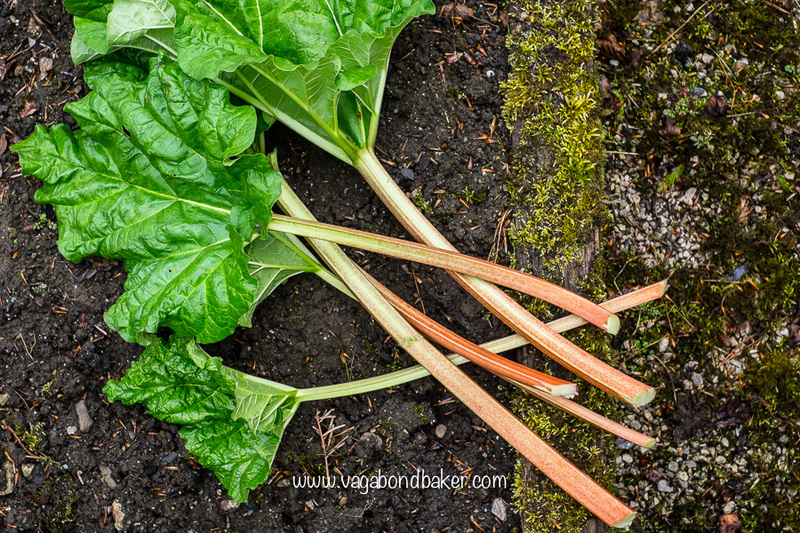 As well as my love of this fruit vegetable, the other main reason I bake a lot with rhubarb is that there is a magnificent rhubarb plant growing in the veg patch at our favourite, regular housesit, which is where I am right now. A handful of freshly cut rhubarb sticks laying on the kitchen counter were aching to be transformed into something delicious. 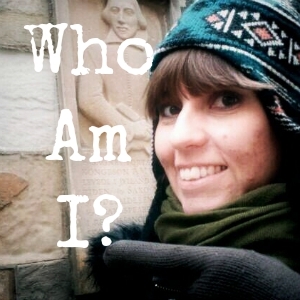 It had to be curd. This tart, sweet, luxurious curd is piped into madeleines heady with vanilla. A French-style bake with a rather English flavour combination: rhubarb and custard. The rhubarb curd is something else, even if you don’t make the madeleines, I urge you to make the curd! I was a little dismayed when the curd wasn’t the alluring pink I was hoping for, I even tried adding raspberries to give it more colour but it still remained a pale toffee colour. I guess you could add food colouring, or maybe freeze-dried raspberry powder? Maybe I’ll experiment again, a couple of batches was enough for now, I don’t want to decimate the rhubarb plant! 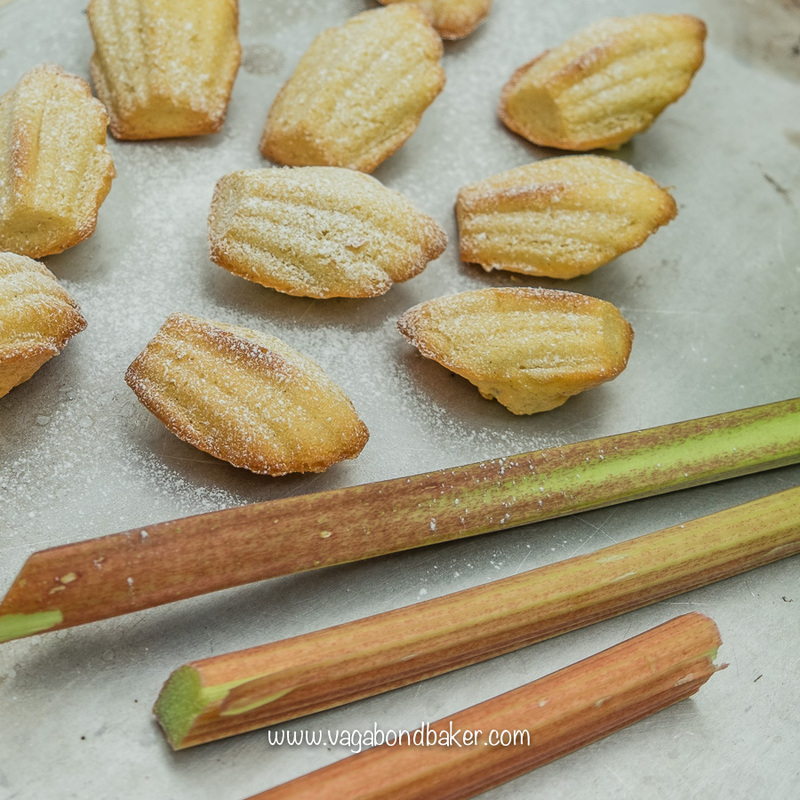 I scraped the seeds from a vanilla pod for the madeleines, the buttery sponge is flecked with the tiny black specks: a heavenly paring with the rhubarb. Originally I planned to use vanilla paste but the local supermarket didn’t have any, at least now I have a bag of sugar being blissfully scented with the empty vanilla pod. To make the curd I roasted the rhubarb with a little sugar and ginger. I like roasting it as it intensifies the flavour, you could stew it on the hob too though. It can also help to retain the gorgeous rhubarb colour, but my sticks weren’t that pink to begin with. It is basically a lemon curd recipe, the lemon replaced with whizzed-up cooked rhubarb, simple and delicious, the addition of ginger lifts the rhubarb flavour. This curd would be amazing with meringues or used to fill a sponge cake, I am totally in love with it! Make the madeleine batter first as it needs to rest in the fridge for a few hours. 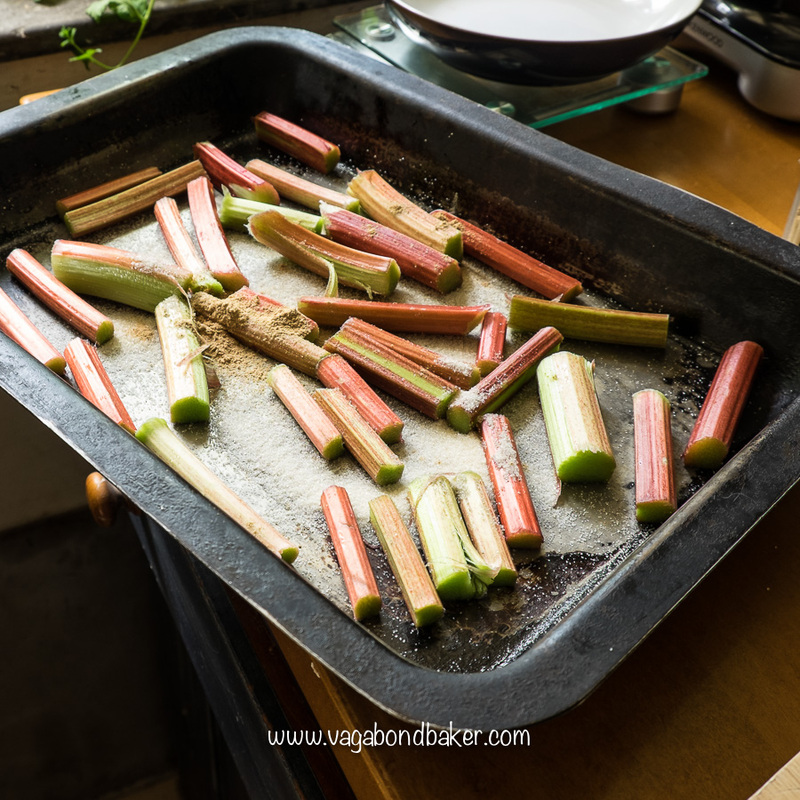 Wash the rhubarb then cut it into 2 inch lengths then place it into the roasting tin. Add the brown sugar and the ground ginger and toss the rhubarb around to coat it. Rearrange the rhubarb into a single layer in the roasting pan. 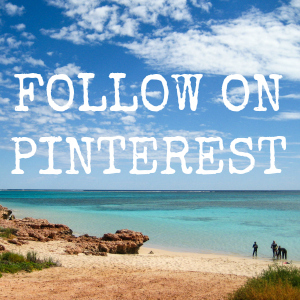 Cover the tin with foil or a baking sheet and roast in the hot oven for around 10 to 12 minutes. After that time remove the foil/baking sheet and poke a knife in to check, they should feel tender but have kept their shape. Pop back into the oven, this time without a cover, and continue cooking for about 5 more minutes or until soft but keep your eye on them. The cooking time will depend on the thickness of the rhubarb. 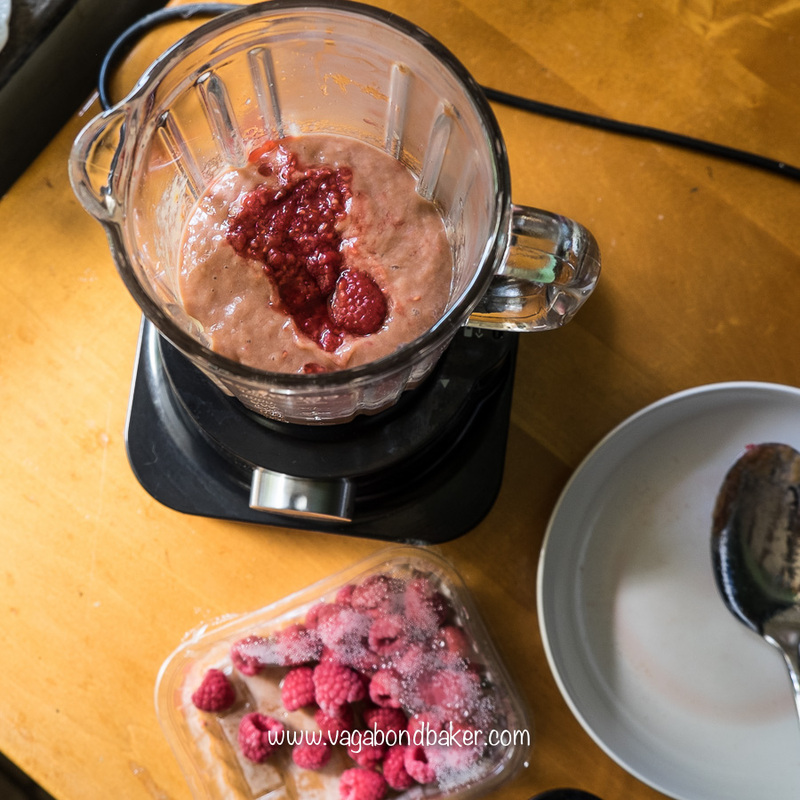 Once the rhubarb is cooked whizz it up in a blender or with a stick blender in a jug, you can add a few defrosted raspberries, like it did, to help with the colour, but it’s really not necessary. Set aside for a minute. Place the butter and sugar into a bowl resting over a small pan of gently simmering water. Allow the butter to melt, stirring occasionally. 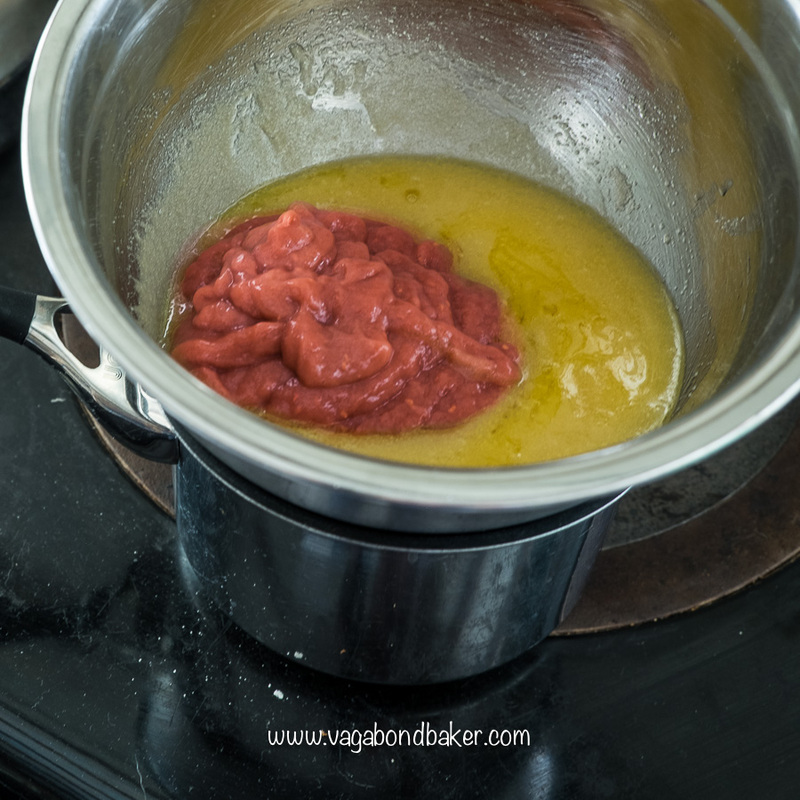 Once the butter and sugar has melted together add the blitzed rhubarb along with the eggs and another 1/2 tsp of ground ginger. Give it all a really good stir to combine then let it gently cook for 25-30 minutes. Give it a stir every now and again, it should begin to thicken. Once the curd is thick, sieve it into a jug to get it really smooth (especially if you have used raspberries, to remove the seeds). Pour it into a hot jar, you should have enough to fill an average jam jar with a bit left over for the madeleines. I don’t worry too much about sterilizing the jar as it never lasts long enough for mould to be remotely a problem! Keep it in the fridge however. Preheat oven 180 C / gas 4 (after the batter has rested) , grease and flour a madeleine pan, unless you are using a silicon one. This recipe is based on Rachel Khoo’s Madeleines, from her most wonderful ‘Little Paris Kitchen‘. Melt the butter, either in a microwave or in a pan, and set aside to cool a little. Break the eggs into a large bowl and add the sugar. 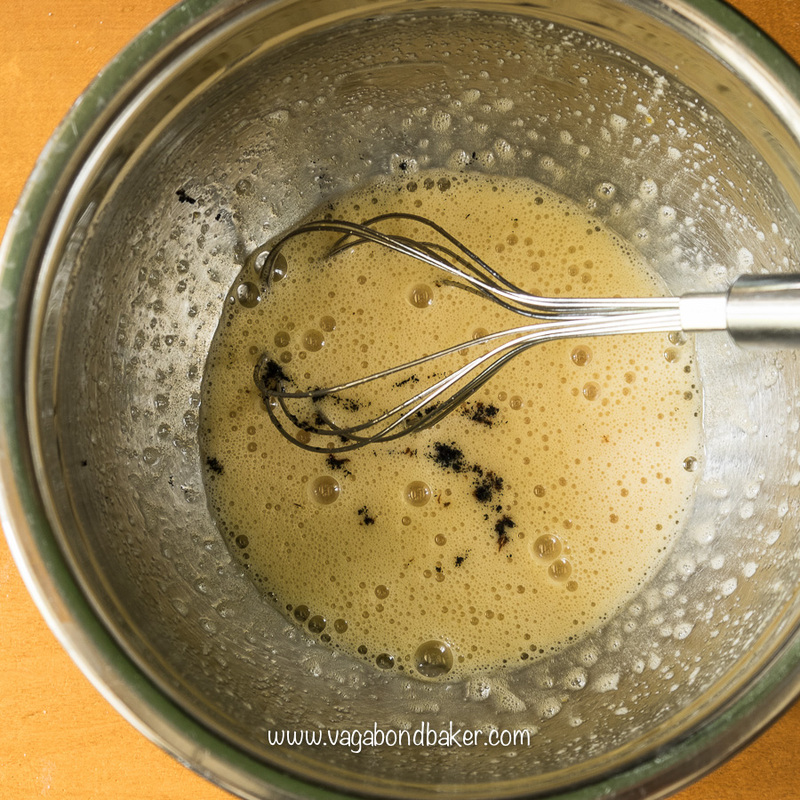 Either by hand with a balloon whisk, or using a hand-held mixer, beat until light and full of air. Beat in the vanilla seeds. Add the milk to the butter then whisk into the sugar/egg mixture. 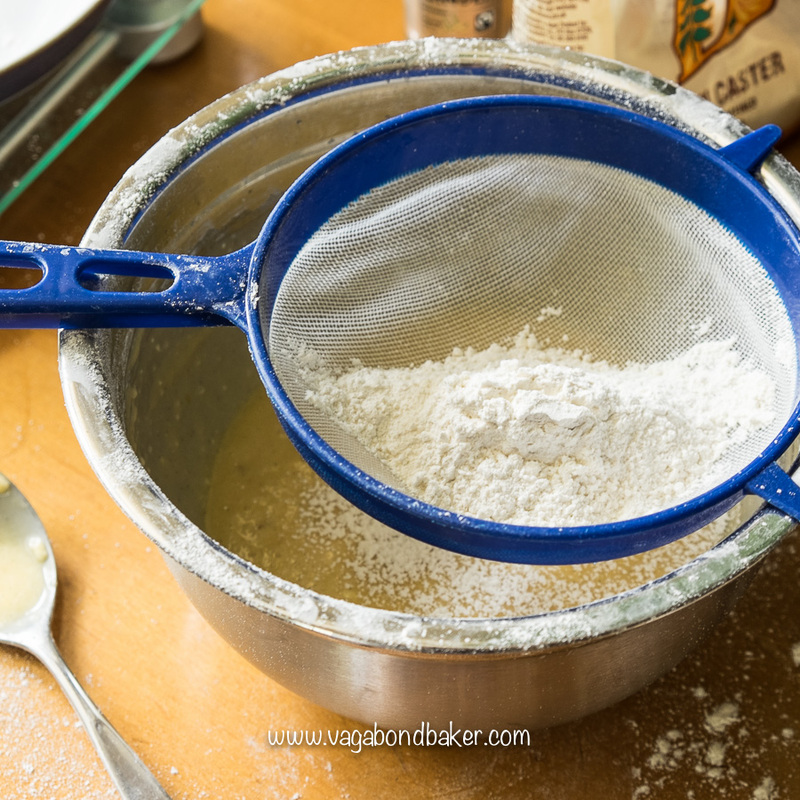 Combine the baking powder thoroughly with the flour in another bowl then sift half of it into the batter. Fold in with a metal spoon then sift the rest of the flour in and fold that in. Now cover your bowl and pop it into the fridge. Leave it to rest for at least a couple of hours, better still overnight. When you are ready to bake them, set your oven to 180 C / gas 4. Place a heaped spoonful or so into each of the shells in your madeleine pan, try not to over fill them or they will spill out over the mould. 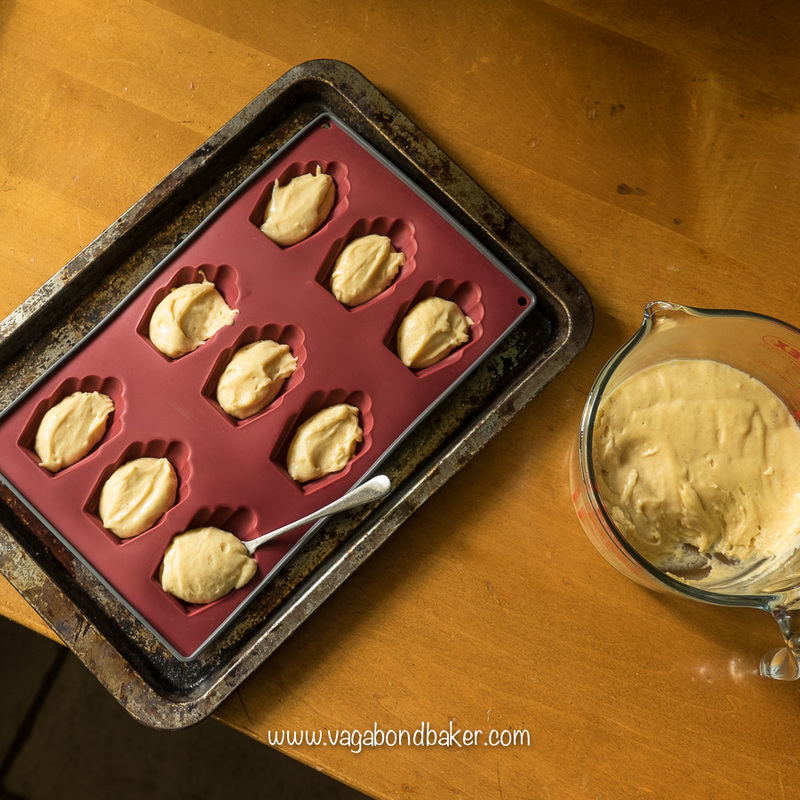 If you are using a silicon mould, place it onto a plain baking sheet for stability. 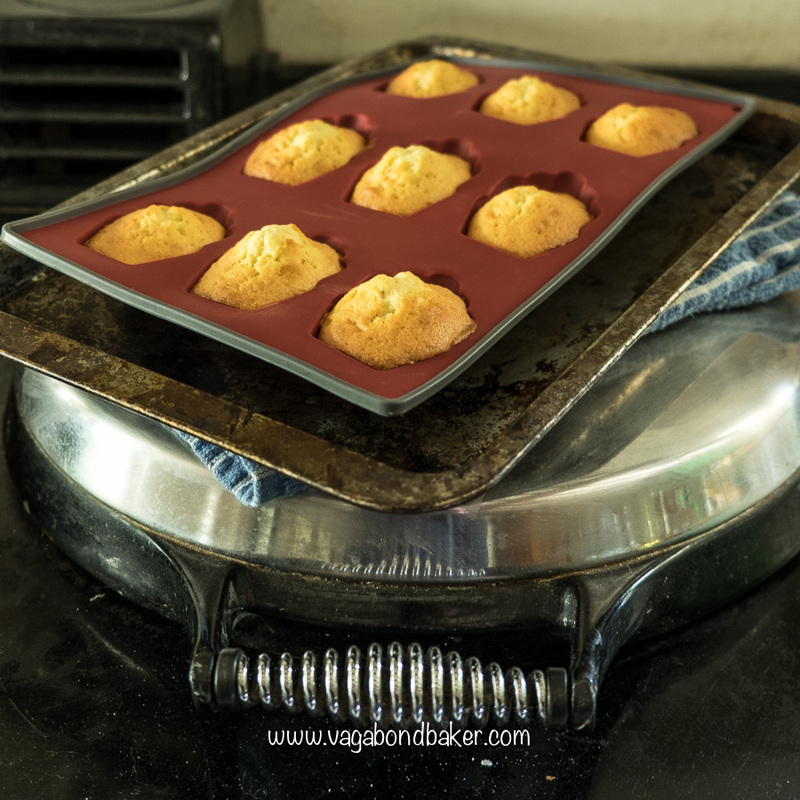 Depending on how many madeleines your pan can make you may have 2 or 3 batches. Bake just one batch at a time, washing out the pan between each. Place in the hot oven and set the timer for 5 minutes. When the timer goes off, open the oven door. Leave the oven on and give it 1 minute open. Now shut the door and set the timer for 8 minutes, your madeleines should now rise! Check them after 7 or 8 minutes, they might need a few more minutes, depending on how efficient your oven is as reheating. 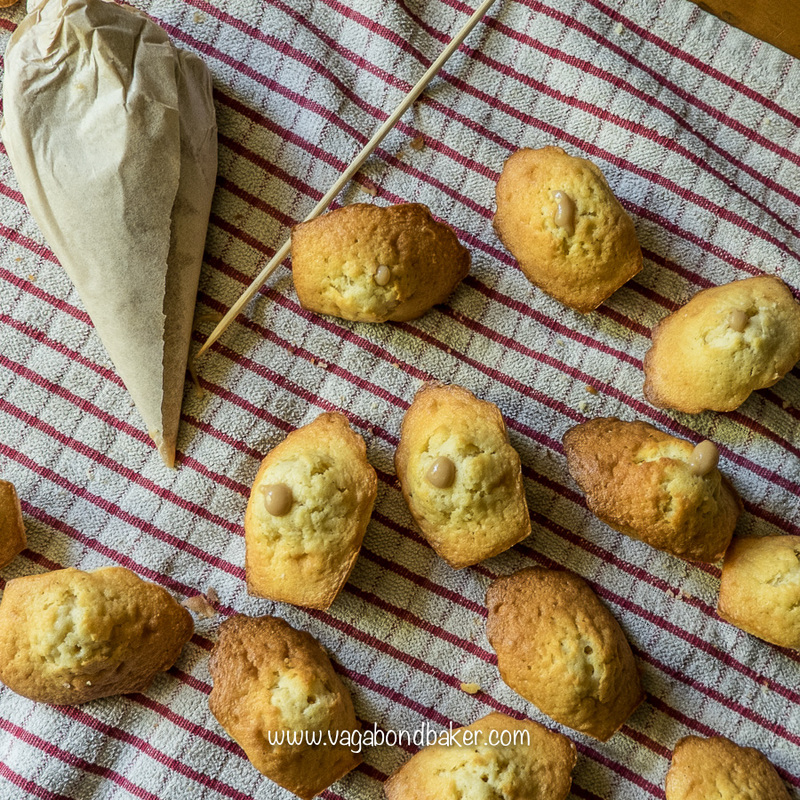 Once the madeleines have cooled, place the curd in a piping bag fitted with a narrow metal nozzle (I didn’t have one and used a paper piping bag with no nozzle and it wasn’t strong enough to penetrate the sponge). Insert the nozzle into the underside (the non-fluted side) of the madeleine and squeeze a little of the rhubarb curd into it. Don’t overdo it or the curd will explode out of the other side. Serve dusted with icing sugar, so dainty, so pretty! 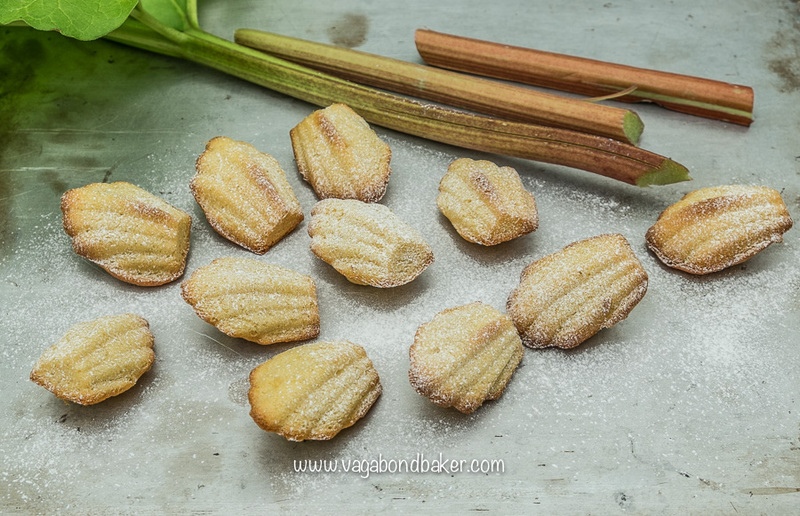 Buttery madeleines flecked with vanilla, filled with tart, luxurious rhubarb curd. 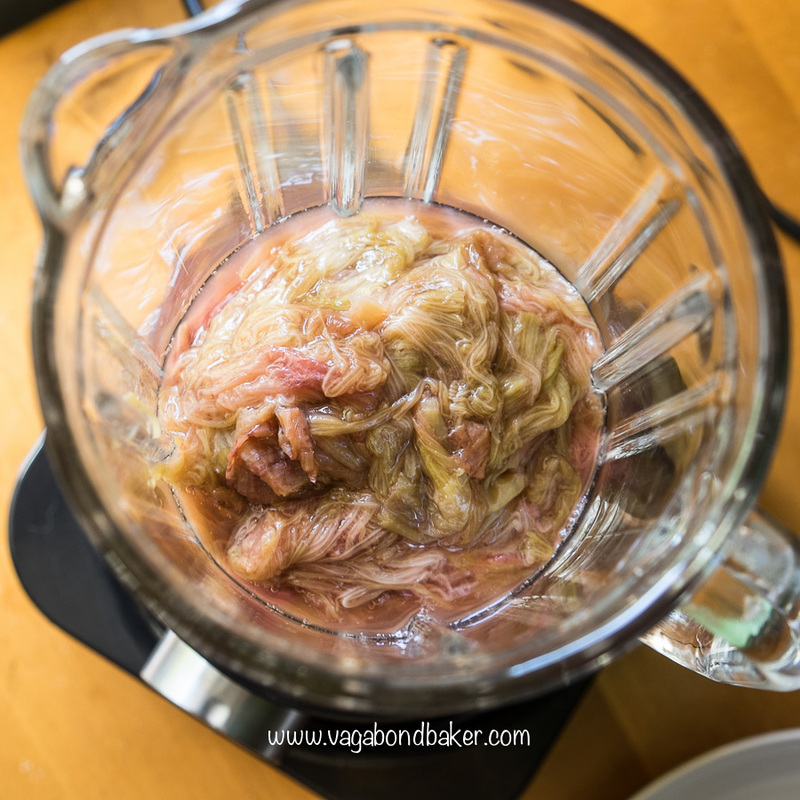 Once the rhubarb is cooked whizz it up in a blender or with a stick blender in a jug. Once the curd is thick, sieve it into a jug to get it really smooth . Pour it into a hot jar, you should have enough to fill an average jam jar with a bit left over for the madeleines. Break the eggs into a large bowl and add the sugar. Either by hand with a balloon whisk, or using a hand held mixer, beat until light and full of air. Beat in the vanilla seeds. 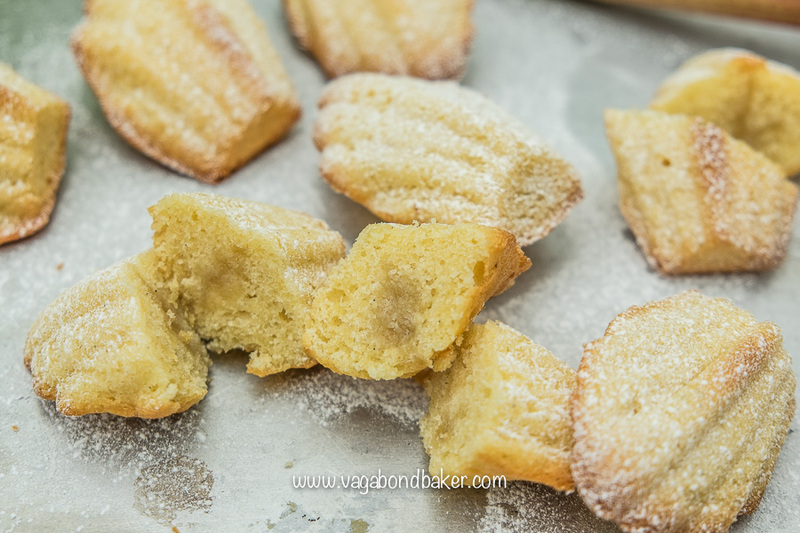 Once the madeleines have cooled, place the curd in a piping bag fitted with a narrow metal nozzle . Make the madeleine batter in advance, as it needs to rest in the fridge for at least a few hours. 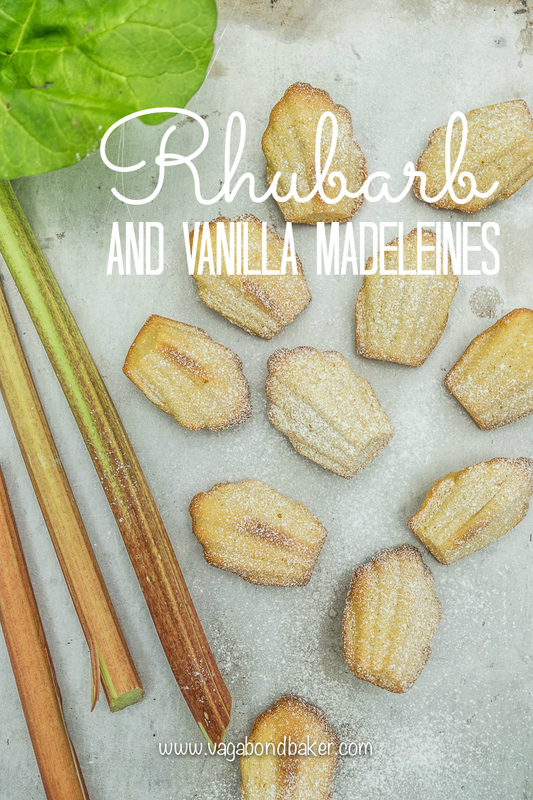 Use the delicious rhubarb curd to fill cakes or meringues, or how about even macarons! What is your favourite thing to fill with curd? 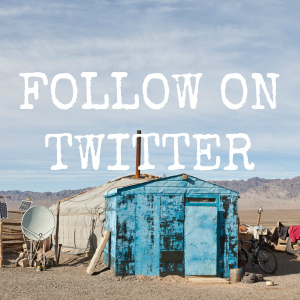 Enjoy this? 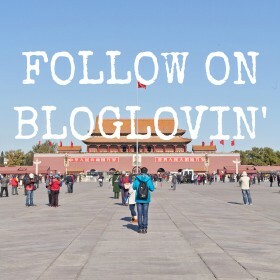 Subscribe by email! I have a lot of rhubarb in the garden and yesterday, I made a stew with rhubarb, apricots and nectarines… it was delicious !!! Yummy! I love stewed rhub! They sound like a delicious inclusion.What did you eat it with?